Those are some serious stilts. Once you think it through though… That actualy may be a good idea. Less vaccuming and stuff when its all in one place you know? From the creators of the Dirt Gravity Shoes, we bring you… COW MAGENT GLOVES! Wake up in the morning and no milk? Well, just put n your gloves and turn them on an watch as a cow(s) come flying through your 10,000 dollar window! Fresh milk on the go! Call nao! How does he walk? Don’t his feet stick to the ground? Dont not sleep and shop, kids. It messes with your mind. how is biff so smart and dumb at the sametime? As before stated(I forget by whom) He got a high roll on Intelligence stats, but a low one on Wisdom. I think Biff invents all this stuff. I mean, who else can think up these things? The goofy commercials never have anything this good. The dirt couldn’t be from walking over the Ankh, there’s not nearly that much of it. I’m still favoring the mad inventor theory…. No no no, think about it: Jack Sparrow, Edward Elric, and Biff. What do they all have in common? They’re all genius’, but find themselves in oddly stupid situations. Yeah, but Jack’s a bloody fop, Ed’s got an ego problem, and Biff apparently still hasn’t found where his brain is hiding. Biff: the Movie. Starring Johnny Depp as Biff. Directed by Tim Burton. Music by Danny Elfman. And I’d be happy to have those shoes too. They’d make cleaning my room up so much easier! That would be the most kickass movie, like, evar. I just sounded idiotc there, but still, that would so own. These comments just made my day. D&D, Discworld, FMA: WIN!!! I wonder how the shoes attract dirt. Maybe someone stuffed Pigpen inside them? 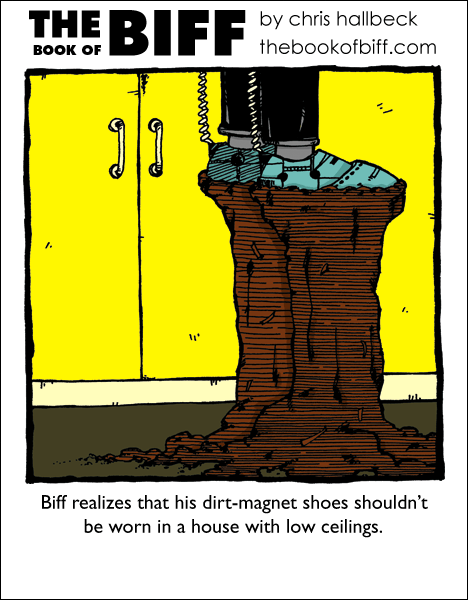 BILLY MAYS HERE WITH THE AMAZING DIRT MAGNET SHOES. Biff seems to have all this high-tech stuff, and I wonder just where he gets it…Perhaps he is a brain-damaged super genius, he creates all this stuff (which happens to border between awesome/useless/hilarious), but doesn’t remember the actual actions……Or he’s a cartoon.